A stone’s throw outside SE7, this, but well worth a mention – it’s the Open Studios at Second Floor Studios & Arts in Warspite Road later this month. Tucked away on the riverfront, it’s a fascinating warren of studios rented by painters, photographers, sculptors, designers, jewellery makers and more besides. It’s part of a five-year plan to convert seven old industrial units into over 300 workshops and studios, together with education facilities, gallery space and a cafe. New facilities include the Thames Barrier Print Studio, one of London’s largest spaces for fine art print-making. It’s one of south-east London’s best-kept secrets, and even if you’d normally hesitate before going to see anything that sounds artistic, you’ll be sure to find something which will catch your eye, and maybe even something you want to take home. The opening night is on Thursday 17th November from 5pm-9pm, with the studios open on Saturday 19th and Sunday 20th from 11am-6pm, at Mellish Industrial Estate, at the end of Warspite Road (turn left just before the road ends, into Harrington Way). More at secondfloor.co.uk and the Second Floor blog. 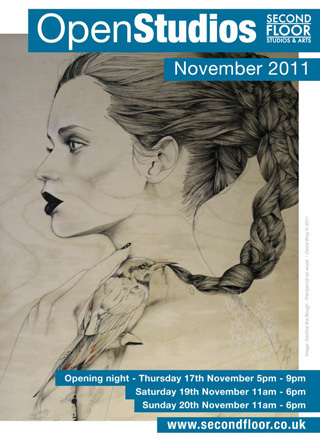 The image on the flyer is Decline the Bough – pen/pencil on wood, © 2011 David Bray. Previous Article Attack at Jennings bookmakers: Did you see anything? I went to the last open day and thoroughly recommend a visit. Some good stuff to look at, and a very friendly atmosphere to the whole thing. Went down mid-afternoon on Sunday and was really disappointed – no information around, no indication of what was open, no suggestions as to what you could expect or what you could see. We wandered around for a bit, saw some other folk looking similarly perplexed, saw a lot of dark studio units, tried a couple of locked doors and came away again. We’d been looking forward to it, and I must admit had kind of expected what we’ve seen at other open studios in the past, ie some sort of welcome and information, and a decent proportion of artists actually there. The open weekend is *this* weekend, not the one that’s just gone. Yes, that’s slightly embarrassing. I’m a muppet.